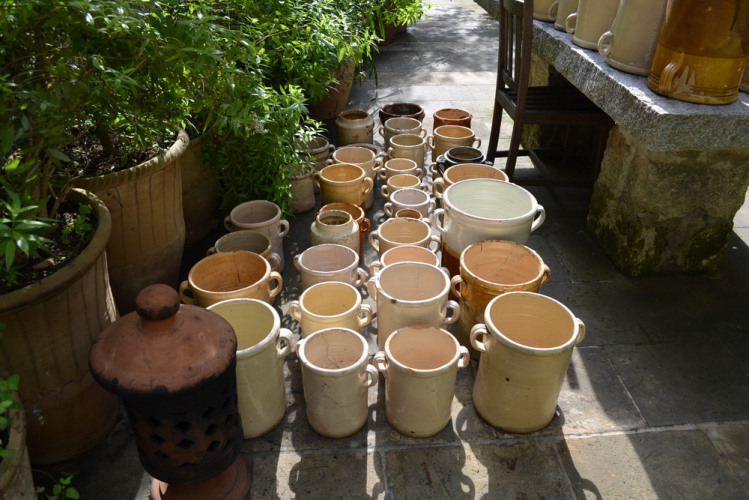 I have had and sold many of these wonderful old pots over the years but like all the interesting 18th and 19th century items they are getting more difficult to find so when a colleague and fellow collector said he had amassed a huge collection of them I was thrilled. The only drawback was that they were way down on the `heel` of Italy. Undeterred I prepared myself for the long drive in my worthy VW van and headed South in pursuit of this treasure trove. 1500 miles or 2400 kilometers (and back!) was a little daunting but it turned out to be quite an exciting adventure and I do love an adventure! It was my first time through the Mont Blanc Tunnel - emerging in a winter wonderland above the snow line was amazing. By day 3 on the road I was getting weary of driving so was much relieved to arrive at my destination where I was looked after in grand style in my host`s incredible 15th century Italian Villa. After 2 wonderful days enjoying the delights of Southern Italy I was ready to face the return journey - so, fully loaded with my `treasure` I set off for London. 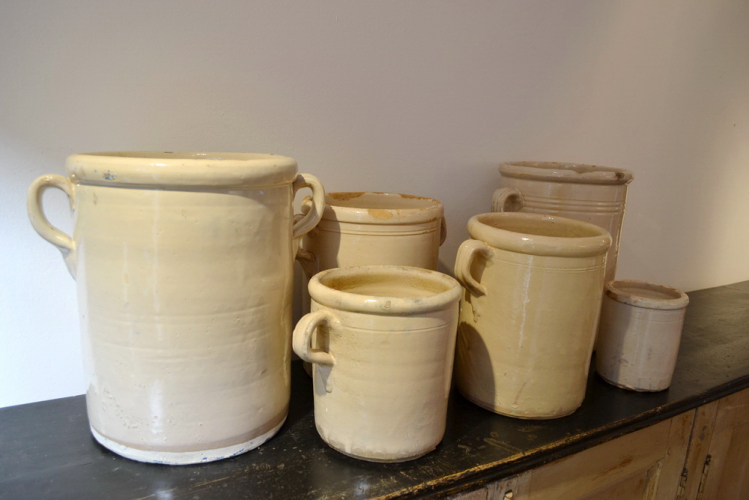 These pots were traditionally used for storing and preserving food stuffs, such as meat dishes, for instance, rabbit, pork, duck, goose, chicken and lamb - they would be cooked up in the summer months when produce was abundantly available then packed into the pots and sealed with a thick layer fat on the top. 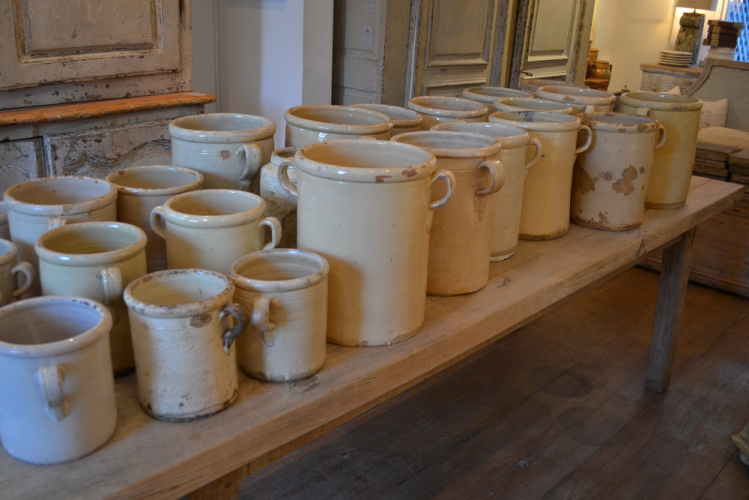 They were then placed in water to keep cool - probably in the cellars - ready for consumption over the less abundant winter months. 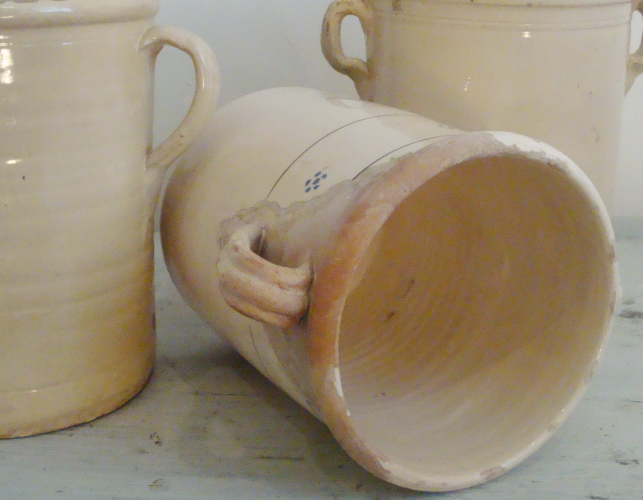 An early technique for preserving food before the advent of refrigeration or availability of ice. 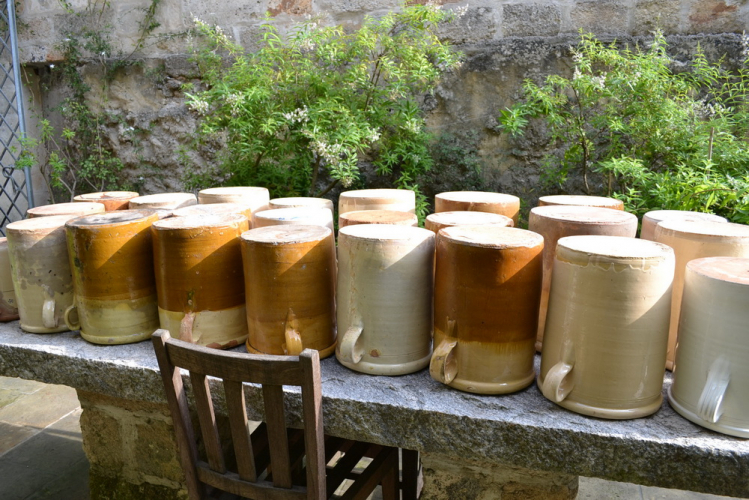 No `use-by` date here - simply the skill and experience of the cook, who would have labelled each pot with the date it was filled and would know if the food was fit to eat. 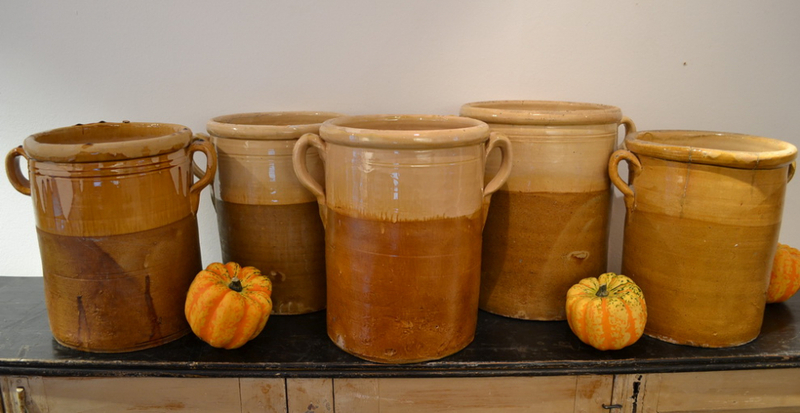 Terracotta is the perfect material for this type of food preservation as it absorbs moisture and keeps the contents at a constantly cool temperature. 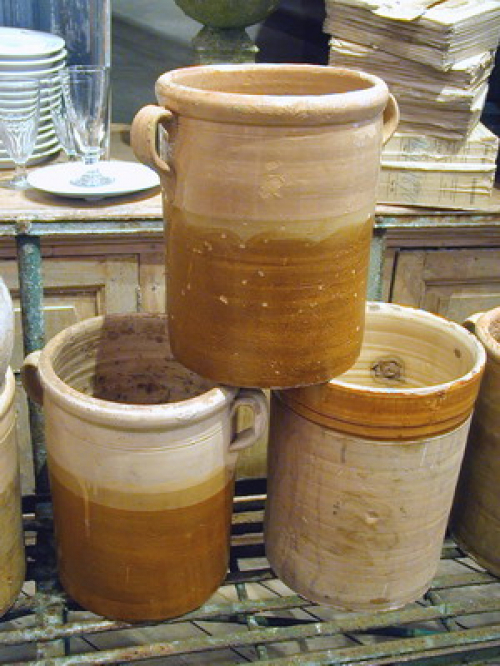 Hence most of these pots are found in hot climates such as Southern Italy, the South of France and Spain. 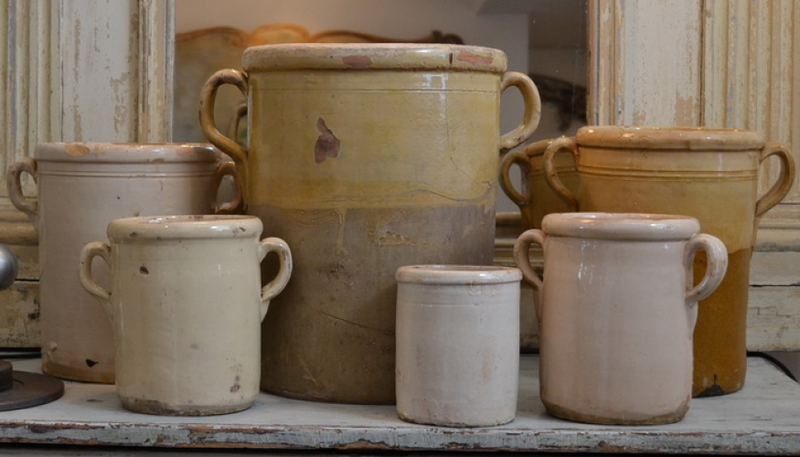 These pots were always glazed on the inside and outside although many are only half glazed on the exterior to allow for easier absorption of water - either in a lovely creamy colour as in Italy - or a more yellow glazes in France and Spain. 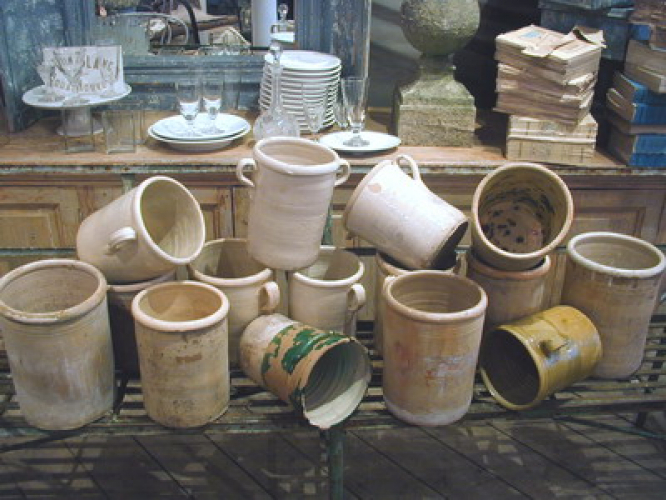 They now serve as wonderful vases for flowers or for storage of kitchen utensils or simply as decorative objects in our more modern environment. 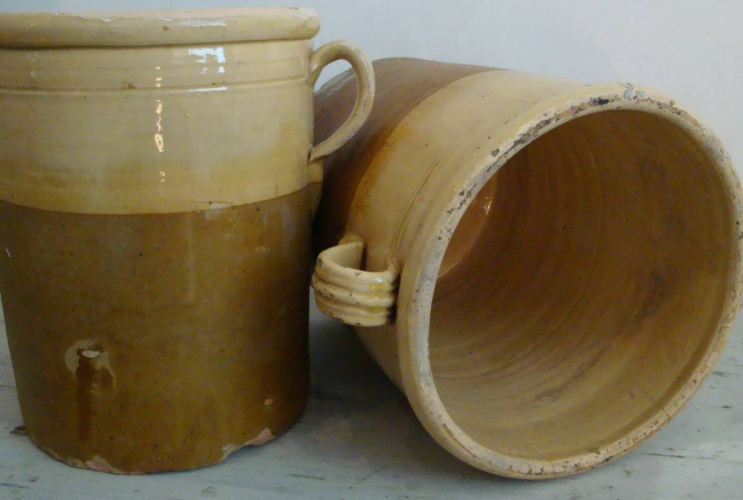 Potty about Pots? We have many beauties to choose from!